The Capitol Dome Will Get A $60 Million Face-Lift : The Two-Way From afar, it looks magnificent, but look closer and you'll find a rusting dome with more than 1,000 cracks. Construction begins in November, when crews will build scaffolding over the 150-year-old icon. The project is scheduled to last two years. A rendering of the scaffold system that will surround the Capitol Dome during the restoration. The west front view of the dome under construction in 1861. 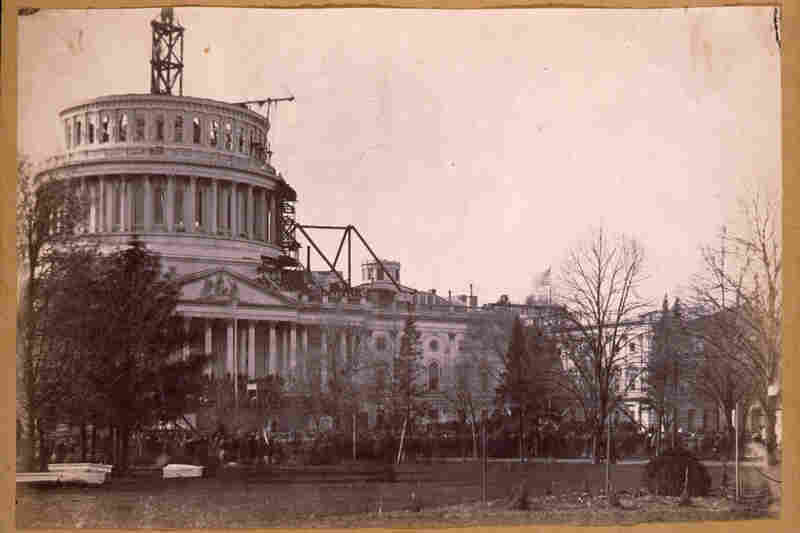 A view of the dome during the inauguration of Abraham Lincoln on March 4, 1861. 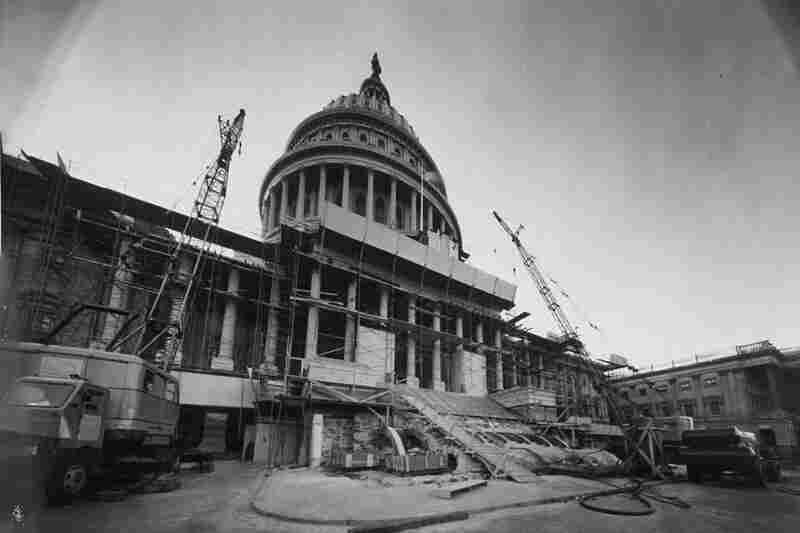 Workers renovating the Capitol in November 1958. 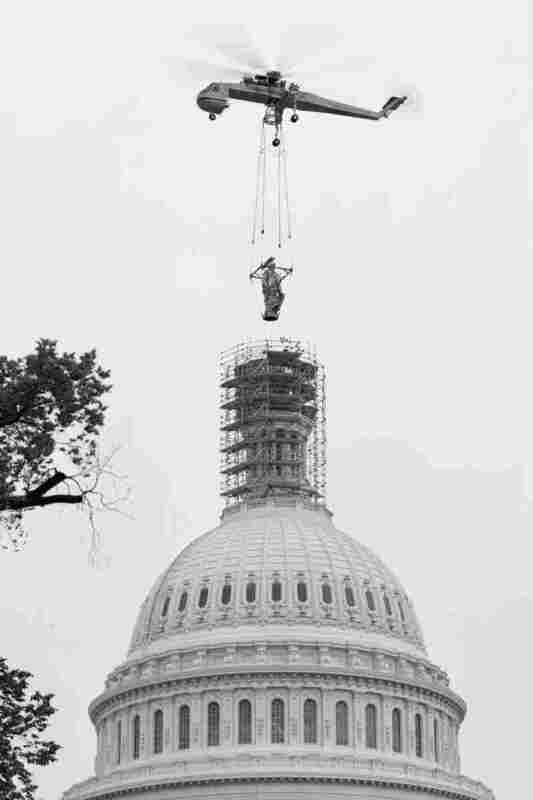 In 1993, the Statue of Freedom was airlifted off of the dome for restoration after almost 130 years atop the Capitol. 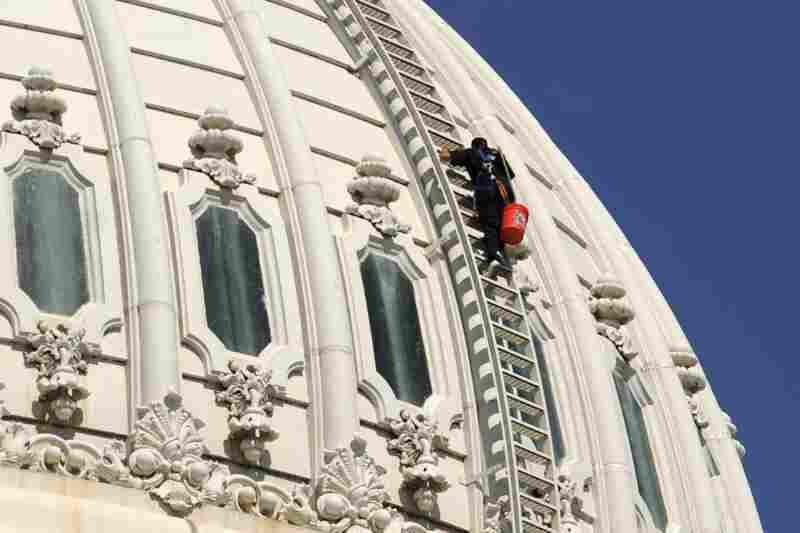 A renovation worker climbs atop the dome in 2010. 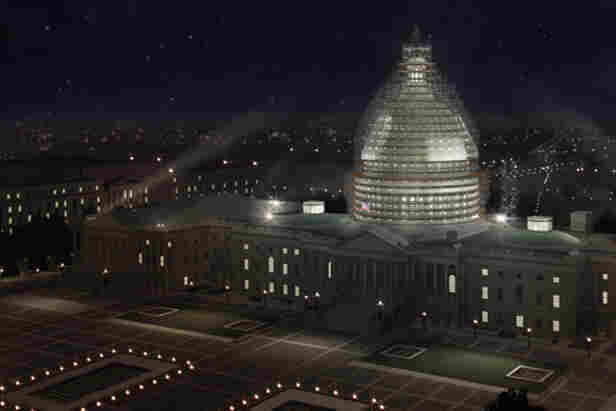 The U.S. Capitol Dome is about to undergo a $60 million restoration. Construction is scheduled to begin in November and last for two years. "From a distance the dome looks magnificent, thanks to the hard-work of our employees," the Architect of the Capitol Stephen T. Ayers says in a statement. "On closer look, under the paint, age and weather have taken its toll and the AOC needs to make repairs to preserve the Dome." Ayers says this will be first time the dome will receive a complete makeover since the one it received in 1959 to 1960. 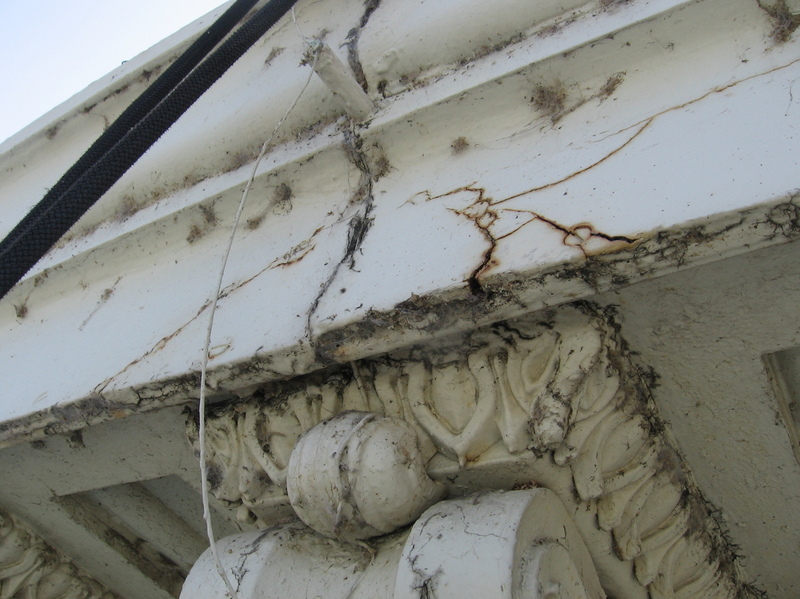 The kind of damage that plagues the Capitol Dome. The dome was constructed of cast iron more than 150 years ago. As time went on, water infiltrated through pinholes in the Statue of Freedom and through cracks and open joints in the rest of structure, causing rust and claiming more than 100 decorative elements. Currently, the dome has more than 1,000 cracks and deficiencies. These pictures give you an idea of the kind of damage we're talking about. The damage, however, has been a problem for years, but the same political gridlock that fueled the shutdown also delayed funding for the restoration project. Back in August of 2012, The New York Times wrote a long piece about the crumbling Capitol Dome. The paper described how leaks caused stains just feet from "The Apotheosis of Washington," the fresco painted on the Rotunda's canopy. 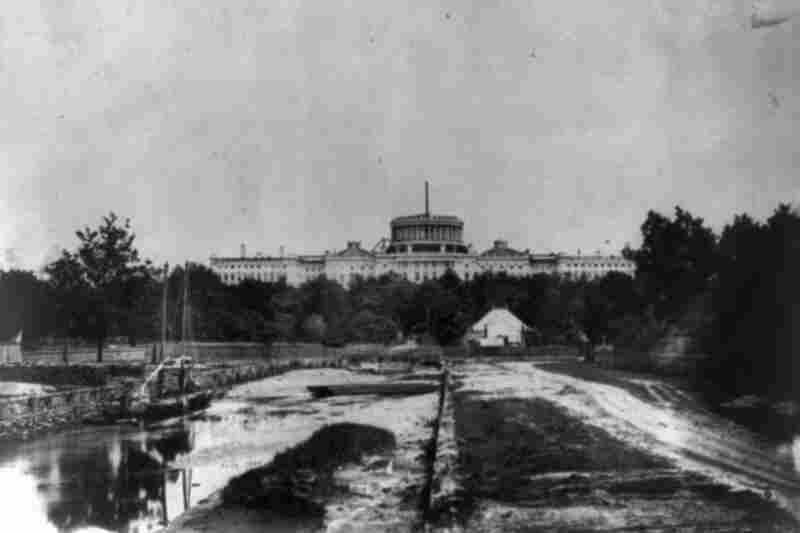 The Senate agreed and voted to appropriate the $60 million, but the House insisted the country did not have the money for the restoration at the moment. In March 2013, however, the $60 million was included as part of a continuing resolution. Today, the Architect of the Capitol announced that soon, crews will construct a scaffold system that will surround the entire Capitol Dome during the project. In a video released by the AOC, Ayers says the Capitol Dome was in the middle of construction during the Civil War. The contractor was told to stop, that the company would not get paid. But they decided to continue anyway. President Abraham Lincoln picked up on that, saying the ongoing construction was a symbol of the enduring nature of the union. "It's a direct parallel to today," says Ayers. "That this country will go on and we have to maintain our symbol of freedom and our symbol of democracy for generations to come."